So 2011 ended on a high with me getting 15th in the Hafren Rally capped off by my first overall win in the CHEC hare & hound race series which in itself secured me 2nd overall in the series. It was this last race that took its toll on my bike, with a lot of damage inflicted on the bike with bits getting bent or broken. 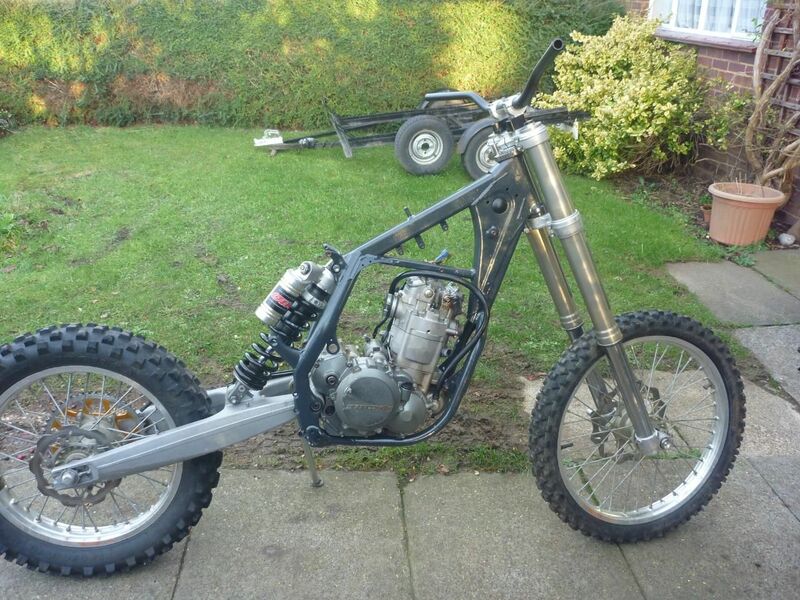 It was this wear and tear that prompted me to go for the full restoration re-build that I never quite achieved fully the last time I tarted up the exc. 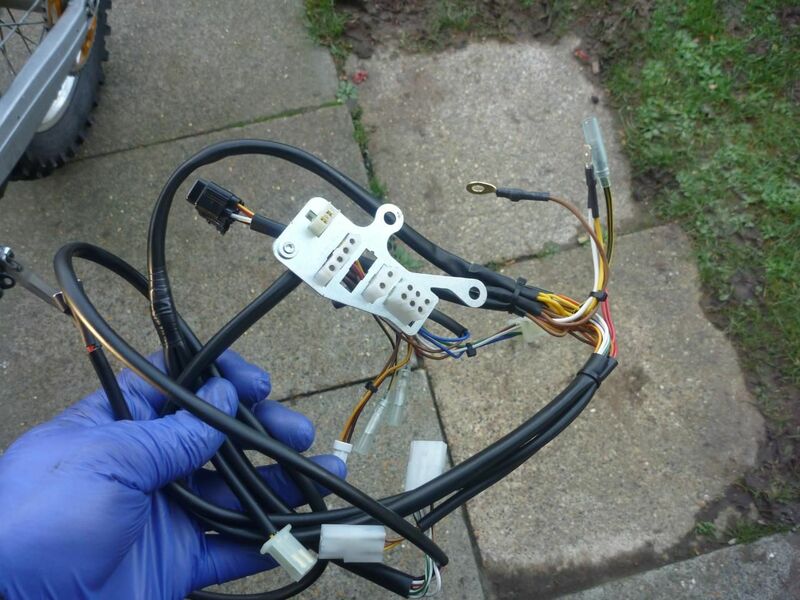 wiring is also a poor state...... after several broken wires and repairs it's looking crap! 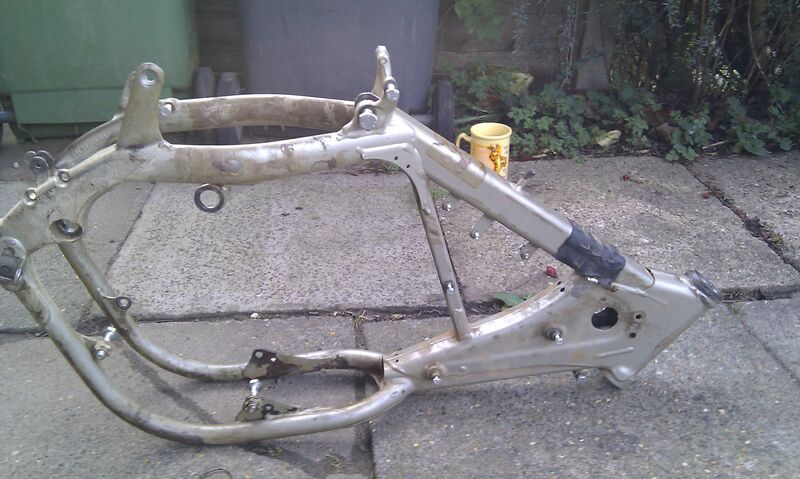 So first of all I had to strip the bike down to get the frame powder coated. This is a fairly easy job to do as it’s just a case off undoing everything and chucking it into a heap in the corner of the garage. But seeing as I want to be able to find things again, I opted for the slightly slower but much more organised option of putting different parts into little plastic bags and parts bins. 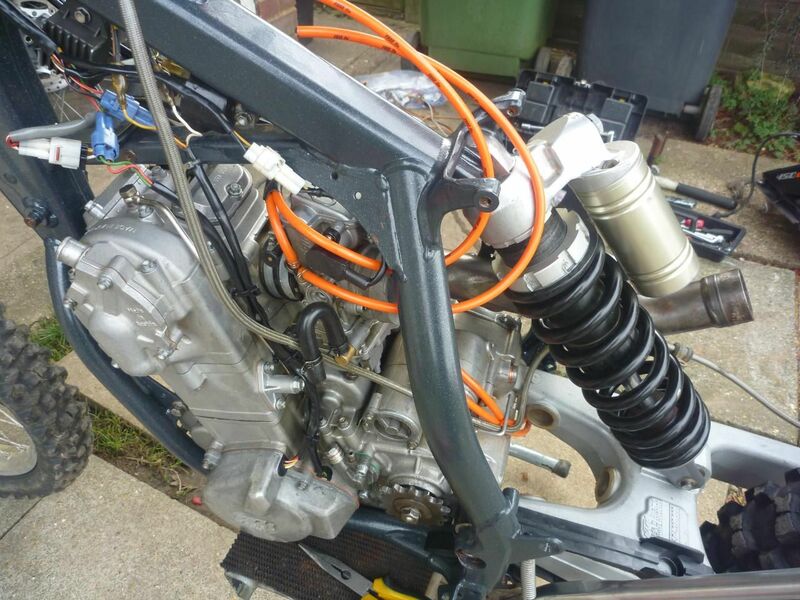 The plan was to strip down the whole bike, bodywork and sub-frame, then to pull the engine out leaving just the frame and front/rear ends - but KTM decided to scupper that idea by running the swingarm mounting bolt through the engine case. This meant I had to take off the swingarm first. Trying to do that without taking the front end off the bike would have made it very unstable, so in the end I had just the engine and the frame left on the garage floor. The engine was a little tricky to get out with the frame not being held down by anything, and I could have done with and extra pair of hands. So now I had to decide what colour to have the frame coated. Most popular is the current trend of going orange as per the latest models. 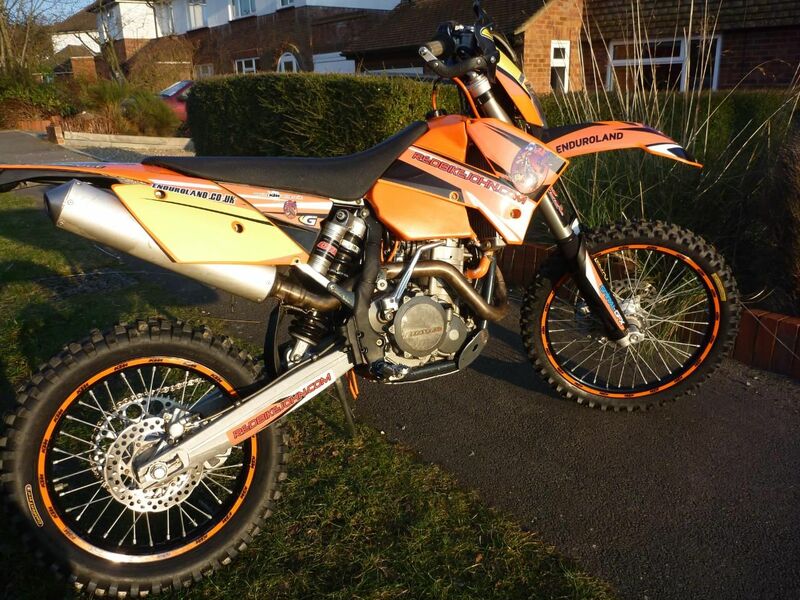 I was going to opt for the ktm orange look, until I noticed just how much the dirt shows up in the nooks and crannies. Orange was out of the running, so I considered black, but that is kind of a boring colour, so in the end I decided on a dark gray, but with a twist. 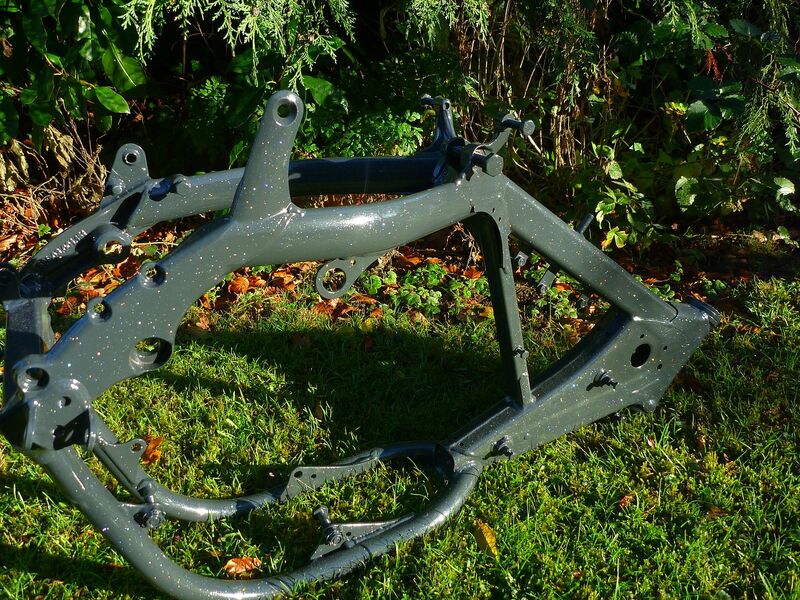 While I was surfing the net I found a pic of a mtb frame done in gray with a clear coat blown over the top with some fleck in it. This gave the powder coat a metallic effect that looked simply fantastic. My mind was made up, I was going to see if I could get the same effect. 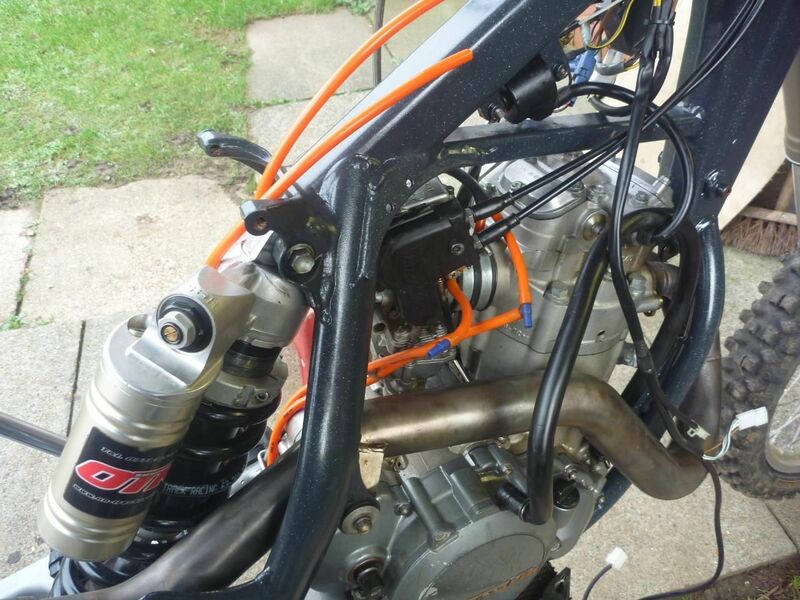 I prepped the frame by fitting a non ktm industrial bolt into every thread on the frame. I left the headrace bearing cups in place as I was going to replace them anyway and it would protect the bearing surface. A bit of searching on the net for companies I found a place in Berkhamstead that looked like it could do it judging from its website. After a chat on the phone I loaded the car with the frame and paid them a visit. Once there I picked out a colour from the chart and discussed the effect I was after with the clear coat and fleck. I left the frame there and I was given a lead time of one week for completion. When discussing the colour I said that I was after a gray so dark that it would look near black but would glint gray in the sunlight with the clear coat and fleck. The next day I started getting worried I’d picked out too dark a colour. For a while I considered calling the company up but in the end I left it and hoped for the best. Picking the frame up in a week or so I was relieved to see that the colour turned out to be just right. Whether he used the same one I’d picked out or the nearest thing in the store room I don’t know, but it was a lot lighter than the colour swatch I’d looked at. I can only assume the clear coat and fleck lightened the colour somewhat, so by a happy accident I ended up with what I wanted and I’m sure (for now) it’s the only KTM with metallic gray frame with 70’s bling! Unfortunately xmas and cold damp weather put a stop to any quick re-build plans I had, but at least it gave the coating a nice long time to harden off in a warm dry house. While stripping the bike down I’d made note of the things that should really be replaced and some others that would be ‘nice to do’. So apart from new plastics all round I had an ever growing list of parts to buy. 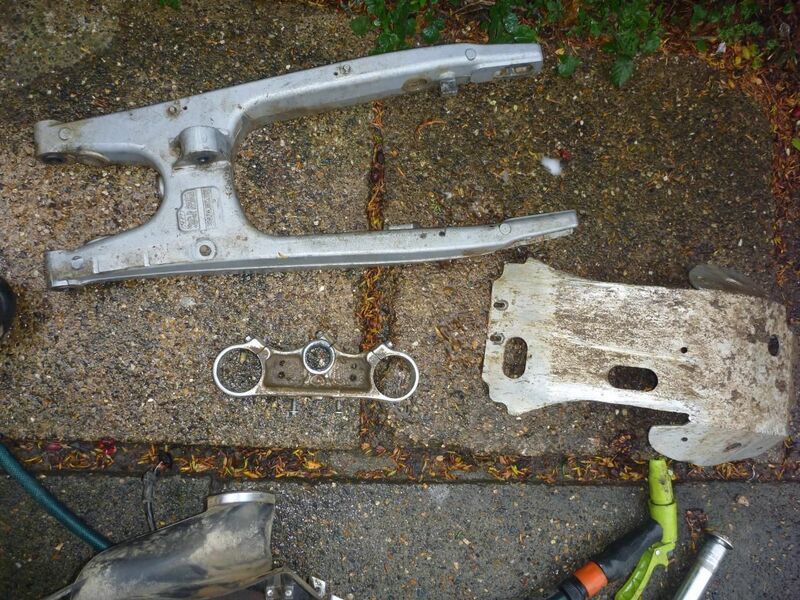 Obviously I needed a new rear brake disc as that was bent first time out at the Tring race. 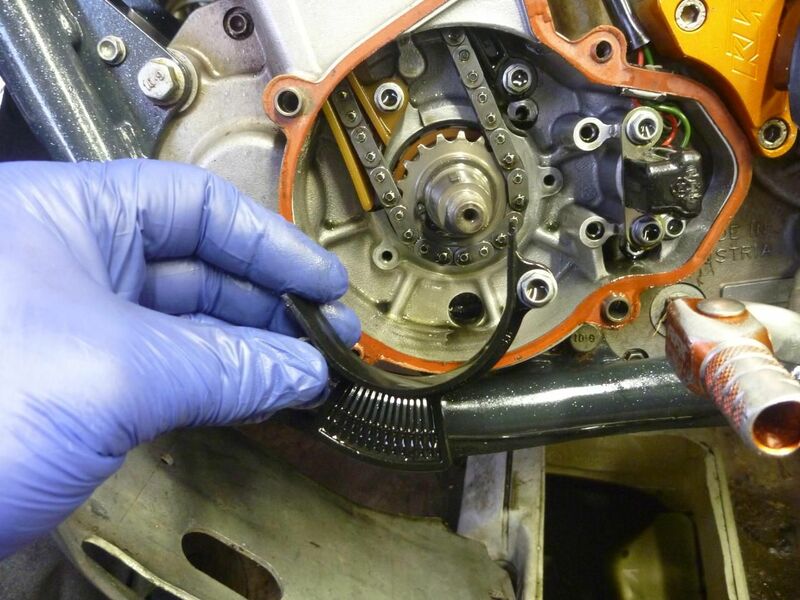 New hand guard plastics as well for the same reason. 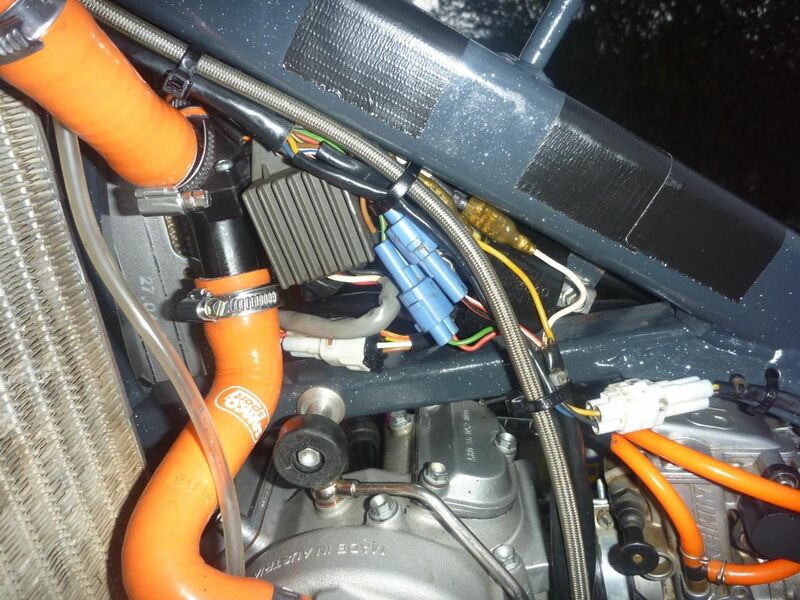 I’d been patching up the ktm’s wiring loam for a while and I thought it would be good to replace that as it would be tragic if one small broken wire stopped a race. 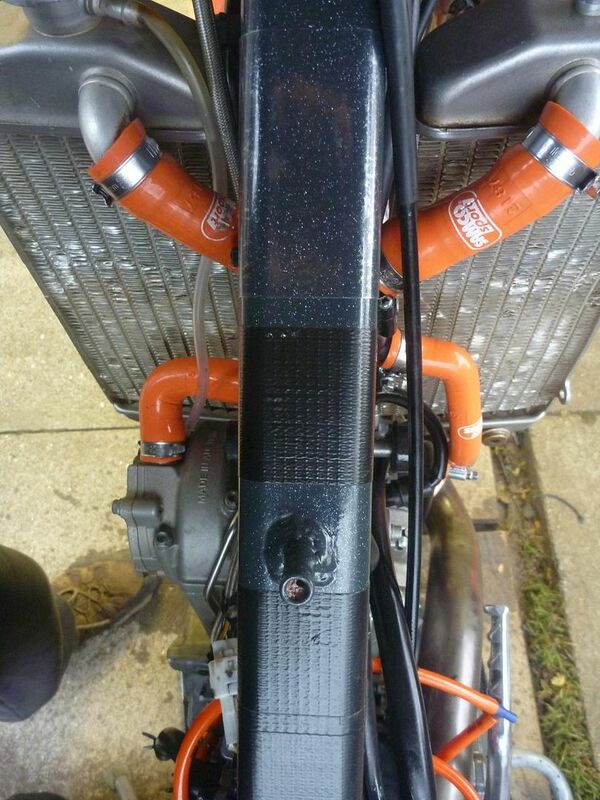 I also noted that the handlebars were quite worn by the throttle grip. The plastic had worn about a quarter of the thickness of the bars so a new set of rentals were added to the list too. I’m no lightweight and the thought of having a bar snap after a heavy handing didn’t fill me with confidence to carry on using them. 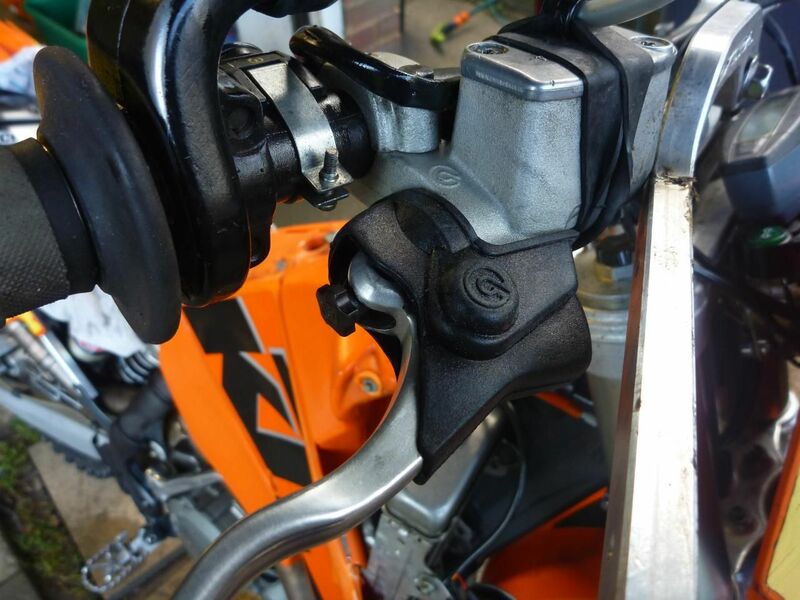 I’d also pock marked the bars where the acerbis hand guard brackets clamped on, as they were forever moving, but as I was now using Cycra guards they clamped on in a much better way, so the old pockmarks looked crap. During the strip down and clean up I noticed a very small amount of rear brake seal sticking out so one of those was added to the list, as well as a new brake piston and new wear plates too. Obviously the new bodywork would be going on but I never liked the look of the 2005 headlight sitting a little odd on the 2009 front mudguard I had fitted. So the order was increased to include a new headlight and surround from a 2009 model bike. While I was at it I also added a new number plate hanger as they are less than a tener and the mounting holes on mine had opened up massively. 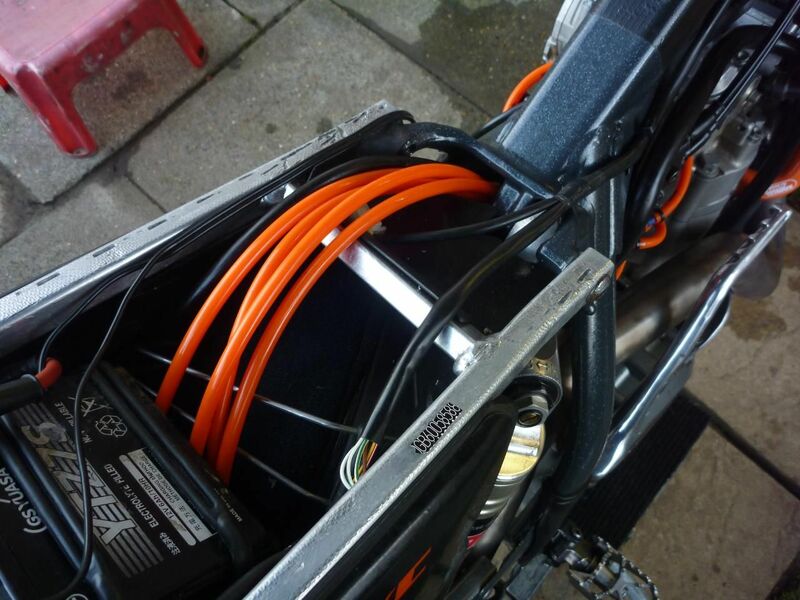 During a trip to the dirt bike show I picked up some orange silicon hoses for the bike. 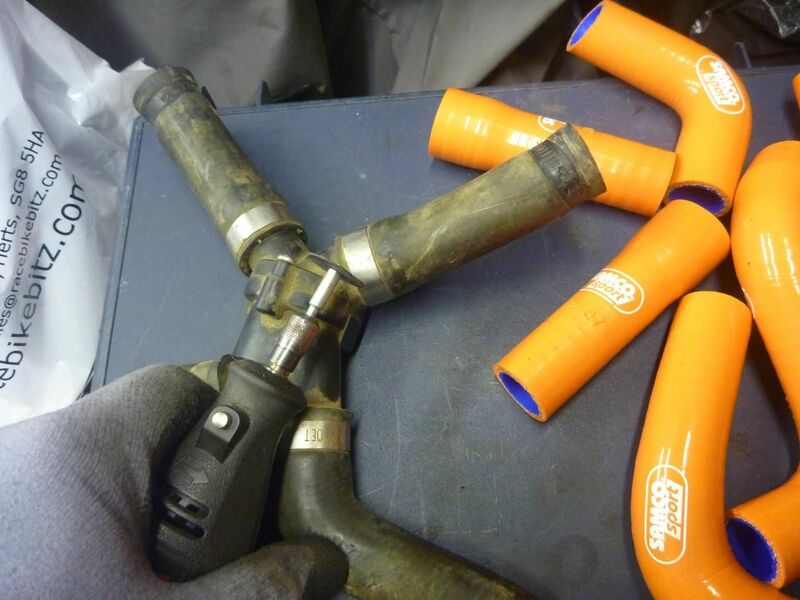 One, as they look good and two, because one of the standard hoses was starting to split. 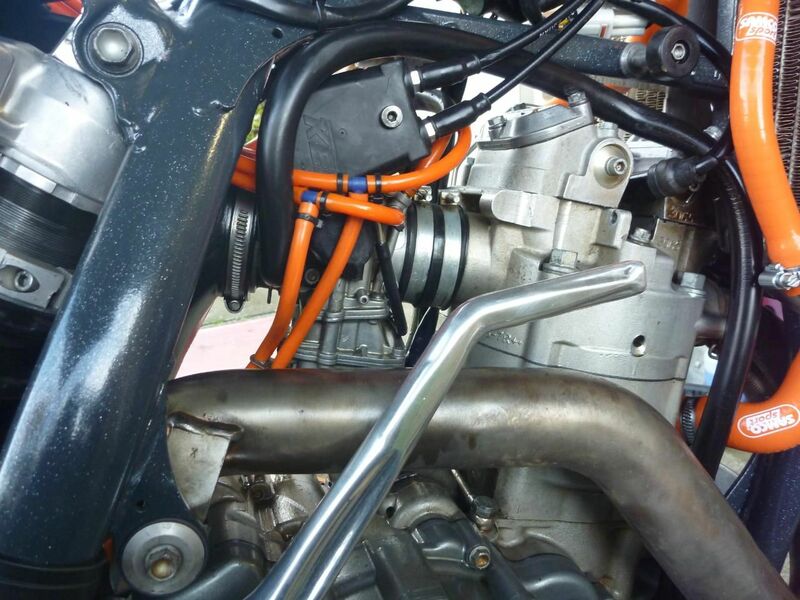 While I was on the orange bling run I bought some orange carb breath hose as well so I was all ready to start the re-build. Then I began to think down the lines of new graphics for the bodywork. If I was going to have some done up this would be an ideal opportunity to approach some potential sponsors for the 2012 race season. Now I knew getting money wasn’t going to be easy, but products and good discounts might be a viable option. 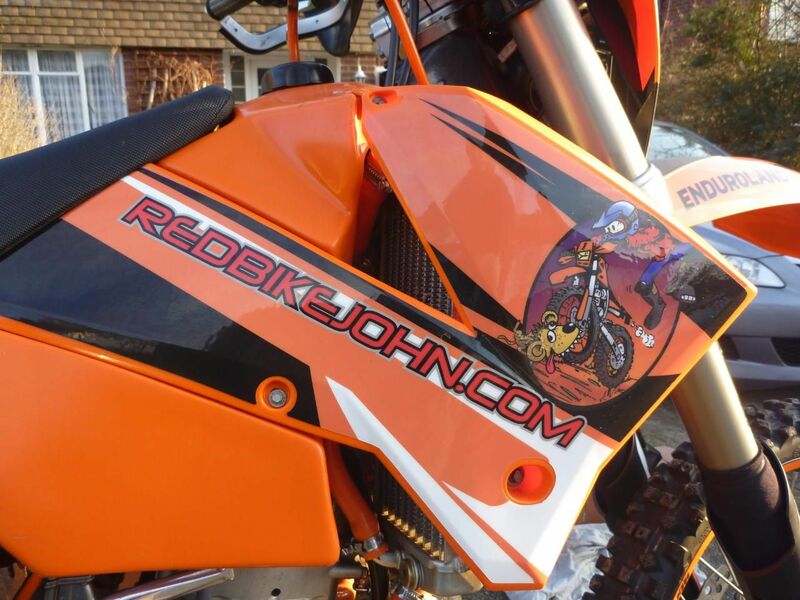 I did my research on how many hits the website (www.redbikejohn.com) had been getting and what I could offer them. Using this information I managed to convince several companies to help out. I’m very thankful that to the following companies who have decided to help me in the forthcoming year. 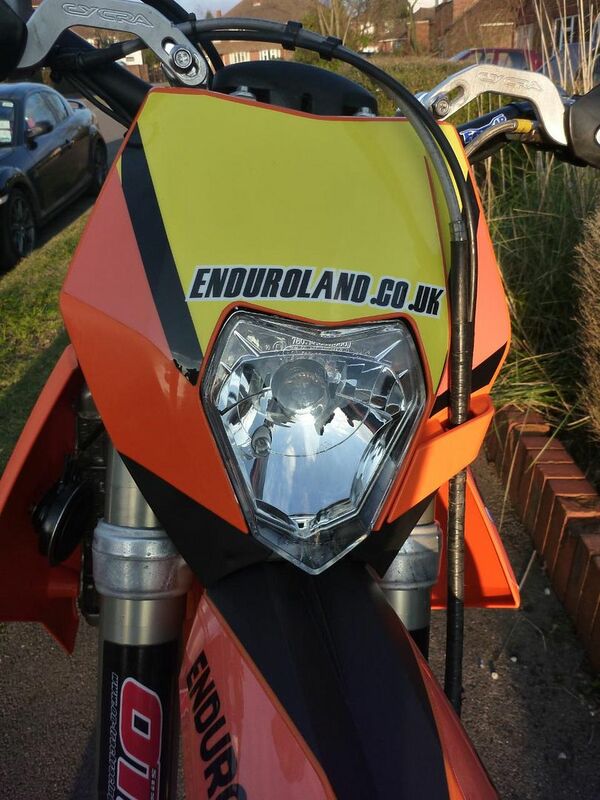 ‘Enduroland’ who are helping with new riding gear, ‘Golden Tyres Direct’ have offered some of their excellent enduro tyres and ‘The KTM Centre’ who is doing me a good discount on parts and the most recent addition is Abingdon Off Road who is also offering a modest discount on parts. time for some jet washing! 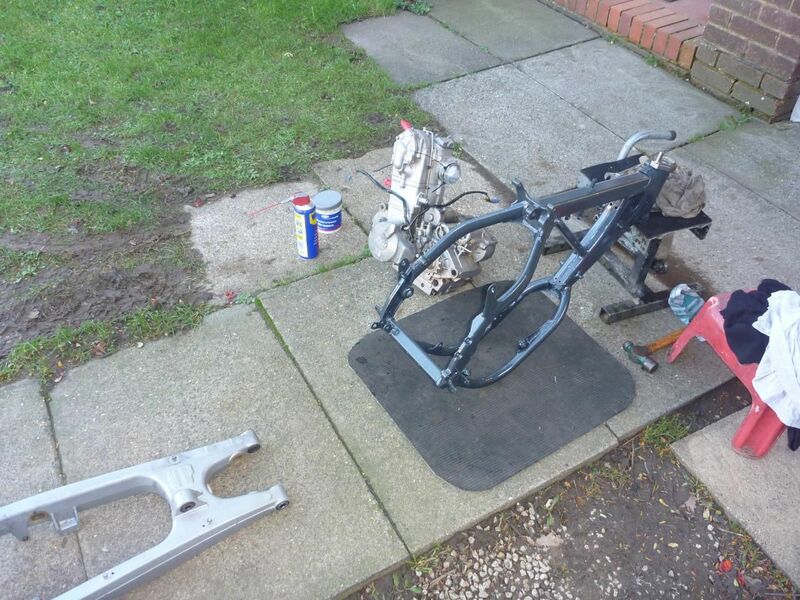 Before the re-build could start I had to clean up some of the parts, like the engine, forks, engine guard and side stand. The Engine had some ugly marks underneath so I gave it a good brushing with a brass wire brush. The sub frame was subjected to a good pressure wash, as was the yokes etc. The engine guard had taken a right battering recently and I can only assume it was at the Tring event as the dent/scratch looked relatively new. It must have been a hell of an impact as it dented in the whole of the underneath! The lower parts were so badly scratched there was just too much work to do to get that nice and who sees it? I opted to just sand down and polish the front and sides. The side stand also got a polish, as did the rear chain guide, which looked really scratched to hell but came up nice enough. My mops are getting a bit worn out so I couldn’t do a mirror finish, I just wanted something better than the ‘bashed to hell’ look that I started out with. time to start getting serious! new bearing is flush when it 'rings' when the driving bearing is hit with the hammer. if its a dull knock then its not home yet...and don't be mean with the grease! All of a sudden the time had flown by. I’d eaten myself in a stupor over xmas and suddenly I was running out of time. Due to the short days there wasn’t a lot of daylight left to work on the bike. I only had one weekend and the remaining week to get the bike ready for a shakedown test up at Enduroland in mid January. First thing first was to get the front end into the bike. Of course I’d not prepped this bit yet so I had to get the old bearings off the steering stem first. 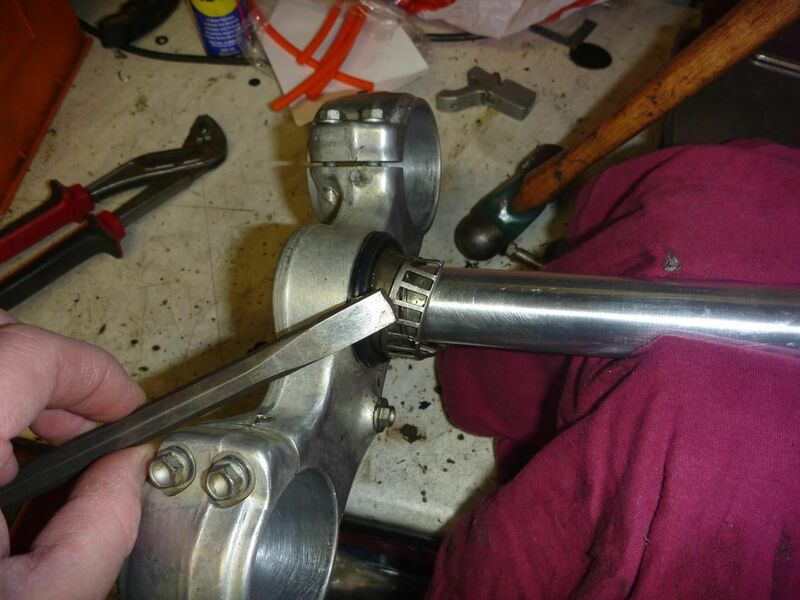 To do this I used a small chisel to remove the outer race of the lower bearing and then used a bearing puller that I’d bought years before and only ever used once. I must say it’s the easiest I’ve ever pulled a bearing off a stem before. Usually I have to resort to cutting into the inner racer to get it off but the puller just popped it off. Then I knocked out the inner bearing races from the frame by using a long rod and a hammer to dislodge them, again a very easy job. The new race was tapped in with a soft faced hammer until nearly seated, then I used the old race (inverted) and a proper hammer to drive the new race home. You can tell when its ‘home’ as the tone of the hammer hitting the race changes and it ‘rings’ when its metal on metal without any ‘give’. Once both races are installed I tend to use a lot of grease, too much even. 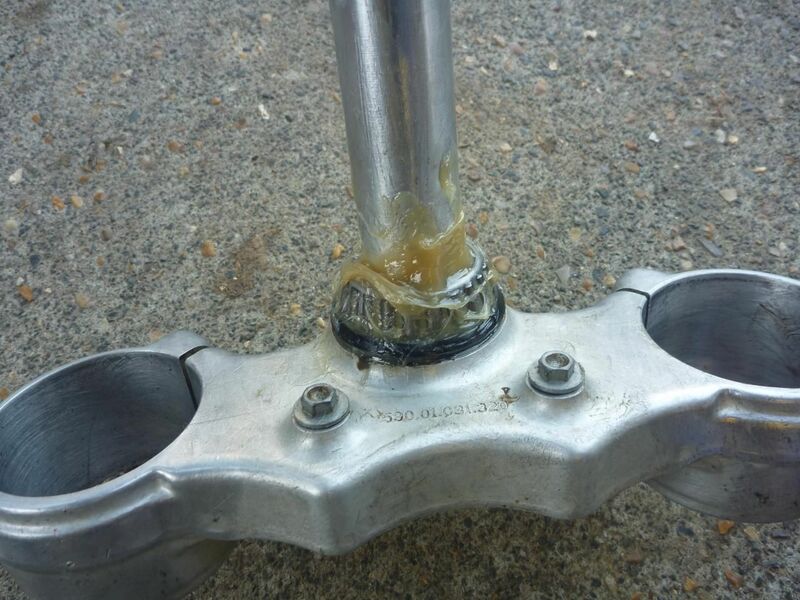 I like the idea of the grease sitting in the lower tube in a lump as it’ll work its way into the bearing as and when it’s needed. It’s always the lower one that gets rusty so don’t be shy with the grease. 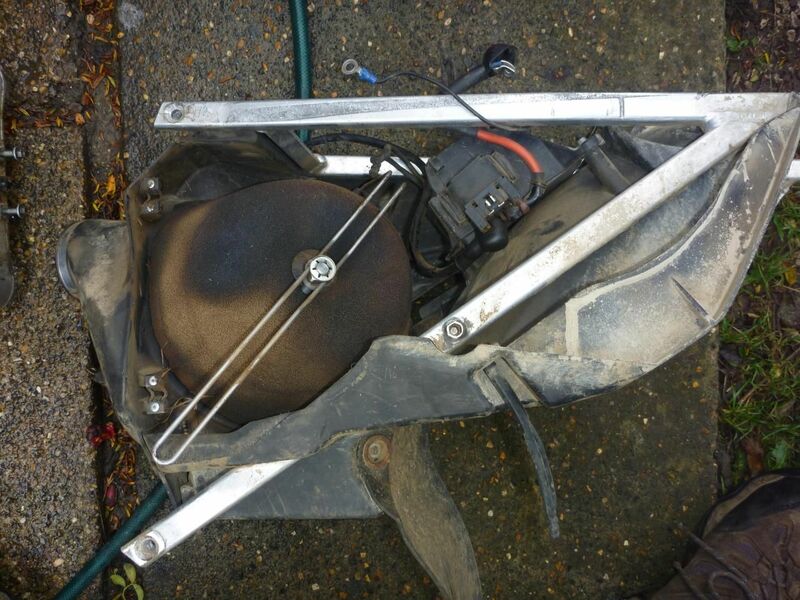 I then lifted the frame up onto a stand and used a ratchet strap to secure it in place. 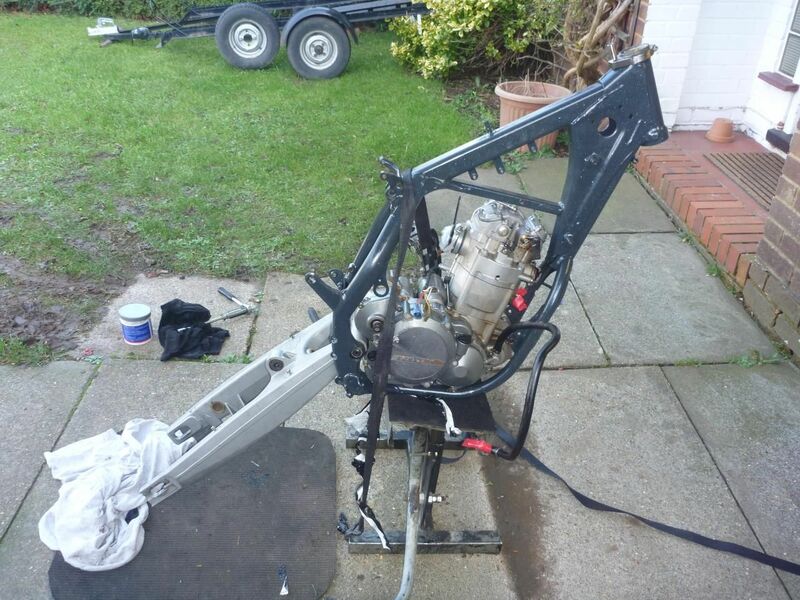 I thought it would be easier to fit the engine with the frame a little higher off the ground to save the old back. 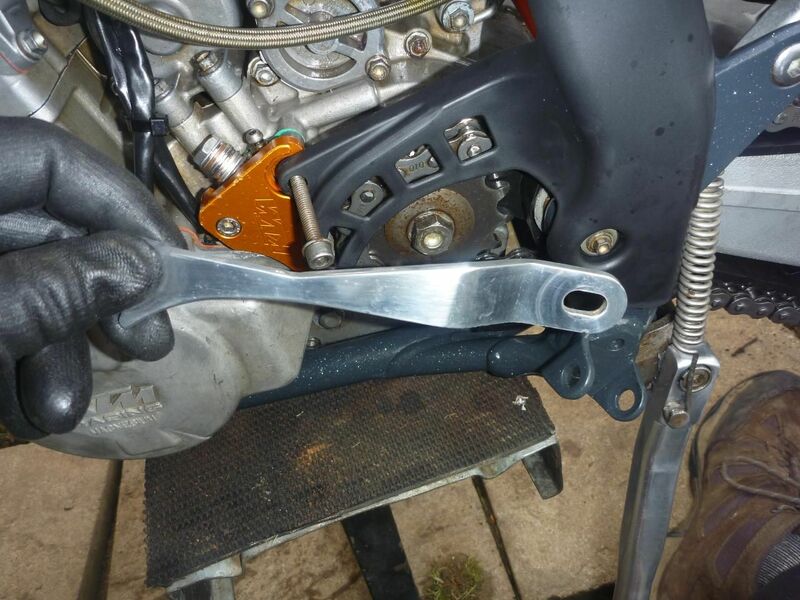 I needed to have the engine in place before fitting the swingarm so I protected the frame with duct tape and carefully lifted the engine into place. It went in easy enough thankfully but the duct tape was a bad idea as it got stuck on the frame lugs and I struggled to remove it. The swingarm was then fitted which is a fairly straight forward job but getting the whole lot to line up was a little tricky. 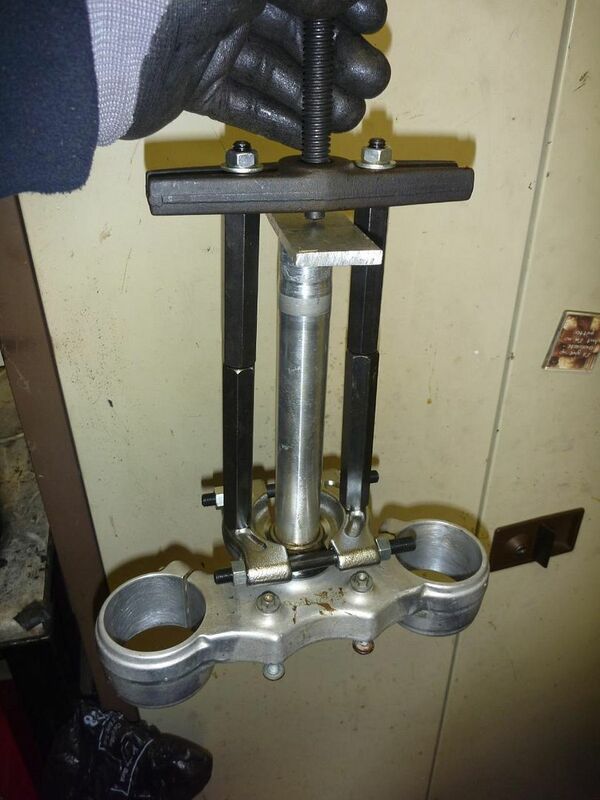 The triple clamps were then pushed into the frame and the top nut tightened so that there was no play but the clamps could still move side to side easily. I gave the inside of the triple clamps a quick wipe with some wet and dry to clean them off nicely and to remove all the old residue. 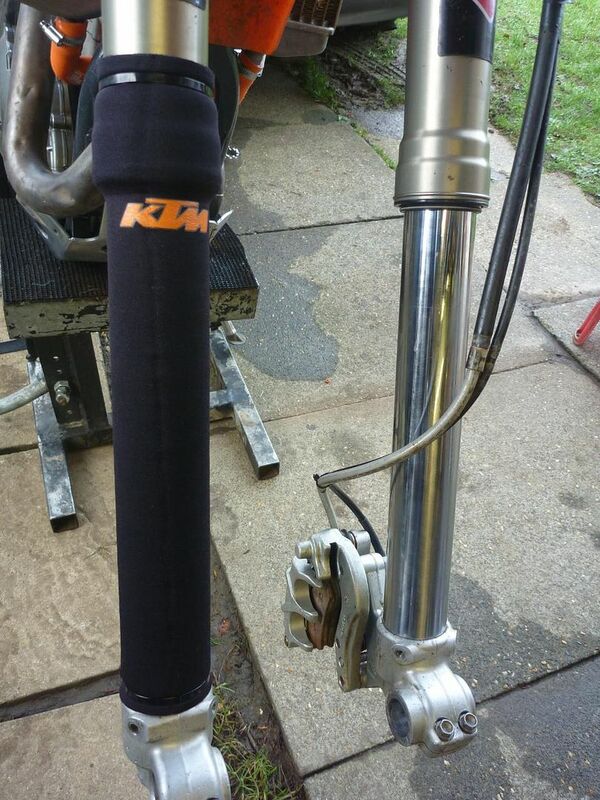 The forks were cleaned up and treated to some new neoprene gaiters as the old ones had grown some holes. 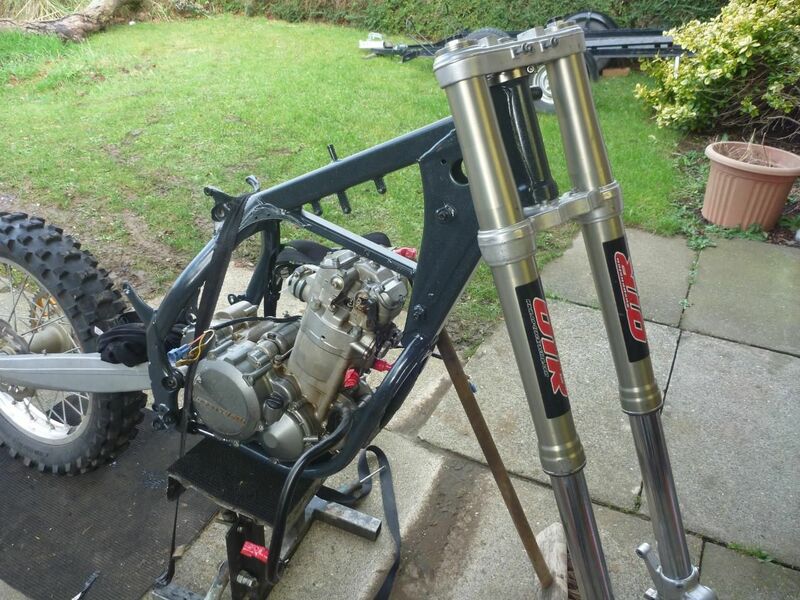 I slide the forks home but only nipped up the bottom clamps for now as I wanted to get the front end bedded in a little first, before finally torque’ing down. ahhh - at last i can move it around. temp wheels fitted and new rental bars in place. 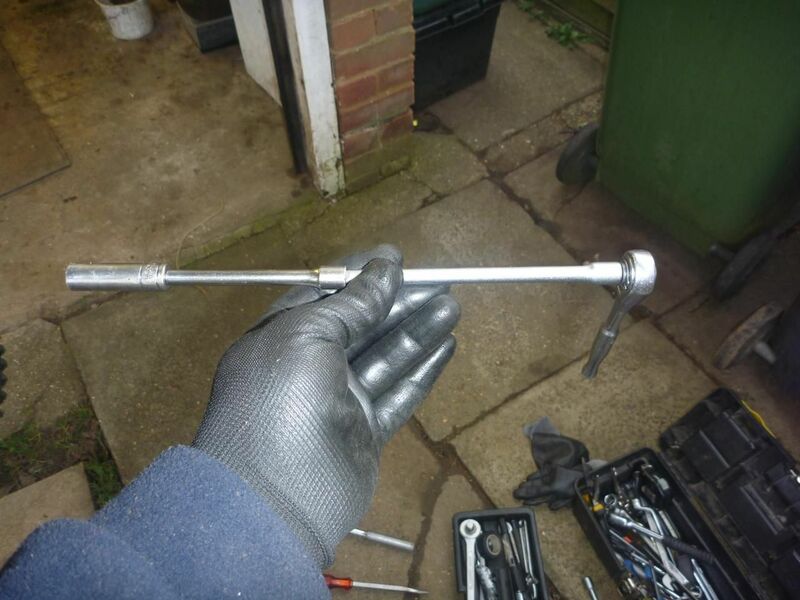 I needed to get the front pipe in place before fitting the rear shock, so I broke out the grinder with the wire wheel brush fitted to give it a good clean up, and to get rid of the baked on rusty residue stuck to the front bend. Of course I was wearing gloves when using a power tool like a grinder, only they were the wrong kind of gloves! I’ve been using a nice coated glove for general use with an elasticated cuff, and it was this cuff that caused the problem. The wire brush tends to bounce a bit when used and on one of these bounces it grabbed hold of the elasticated cuff and wound itself into my wrist! It happened so fast I didn’t even have time to register. 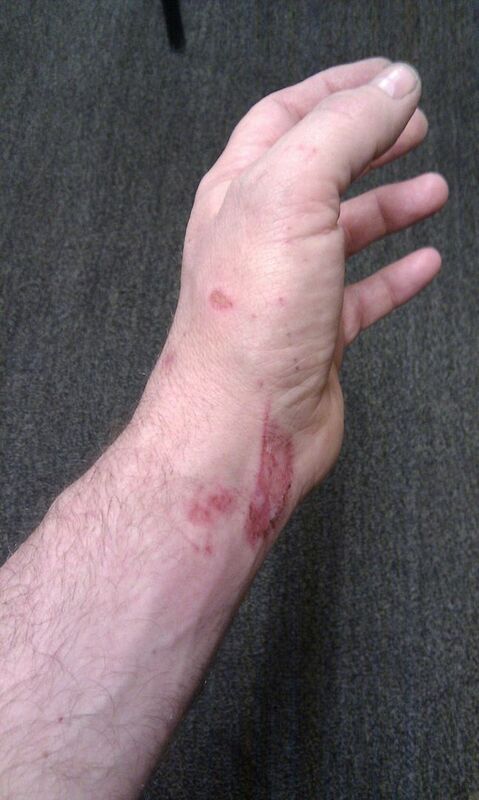 I was holding on tight with my right hand and the grinder was jammed into my wrist and trying to turn but the glove had wound around it and stopped it when it dug into my wrist. For a moment of two I could hear the motor buzzing as it tried to turn but then I came to my senses and flicked it off with my thumb. Un-raveling the whole mess I anxiously looked at my wrist as there are so many veins and tendons there I was worried I’d ground them away. Blood was starting to ooze out quite worryingly, but at least nothing was spurting so I got the first aid kit out the back of the car and wrapped a dressing/bandage around it and went to have a cup of tea to chill for a bit as both hands were hurting from fighting the torque of the motor. "if you're ganna be stupid you gotta be tuff"
After tea I fitted the exhaust into place and then I could get the rear shock into the frame too. That just left the wheel and bars and I could move it around the garage/garden a lot easier. Fitting the bars was straight forward enough, but however easy it is, there is a lot of cleaning to do for each of the ‘easy steps’. I didn’t want to put anything back together that hadn’t been cleaned and brushed, as well as all the treads cleaned up ready for new copper grease or loc tight– depending on the application. 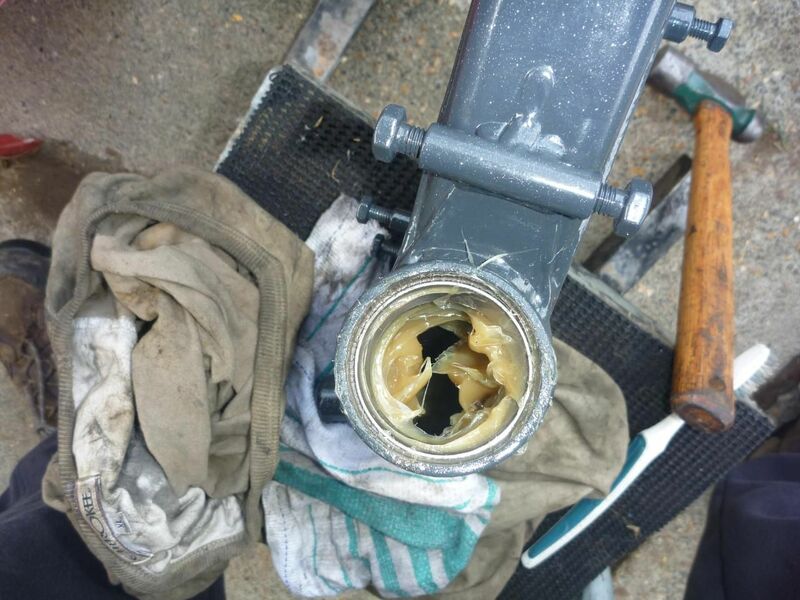 Each thread was cleaned up using a wire brush and all old grease/dirt was dislodged with a dose of wd40 and a toothbrush then blasted with more wd40 and an airline. Threads to be loctightend had the threads cleaned with electrical de-greaser and then blasted with an airline. Tony came round, took one look at the bike and asked if I was going to use the Tenere or the MTB at Enduroland on the weekend - cheeky bugger! Oh yea of little faith. Once he was finished drinking tea and mooching whatever he was after he went away, and once more I could knuckle down to some serious re-building work. I fitted my spare set of wheels as I needed to fit the new rear disc to the black set I picked up last year and I also fancied some bling bling rim tape, which I still needed t buy. some more bling. 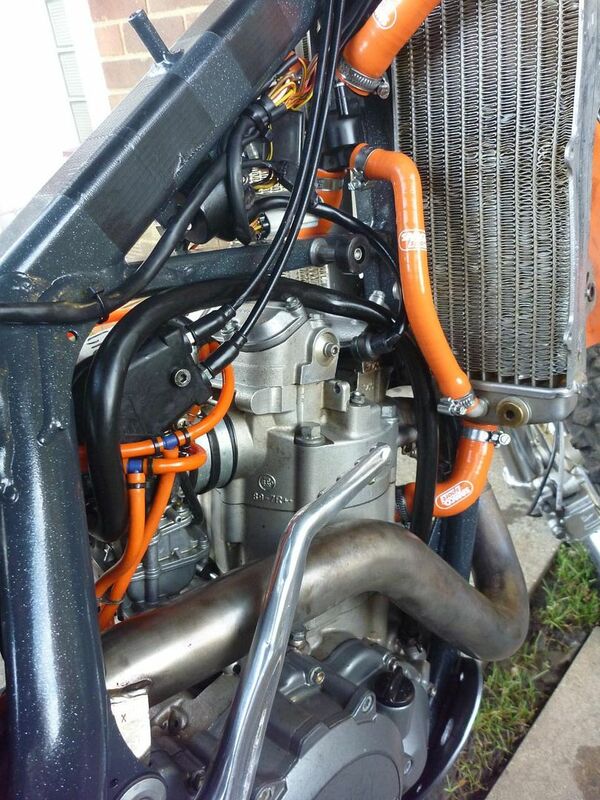 carb all fitted and now time for some orange! 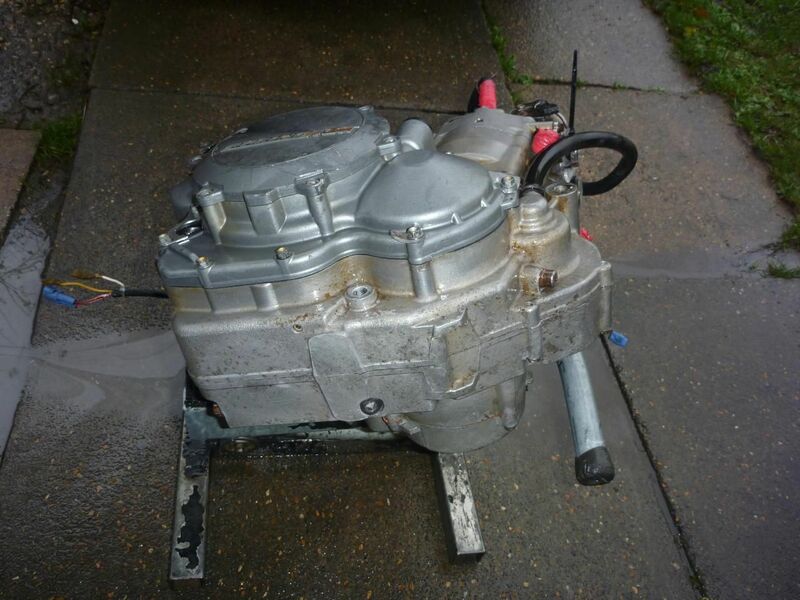 Next up was the carb, followed by the new wiring loom, coils and rectifier and then to cap it off the rear sub-frame. Once they were all in place I started on the carb breather pipes but as I’ve re-routed some of them, I ran out of pipe. 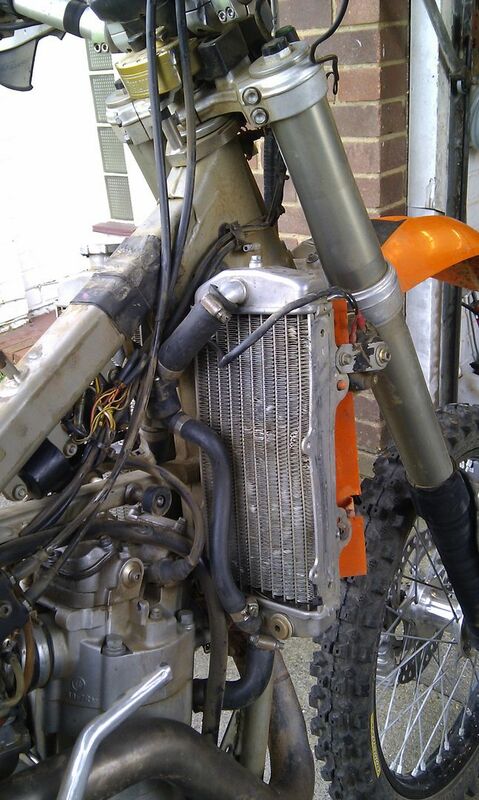 I then swapped out the radiator hoses for the new bling silicon ones. 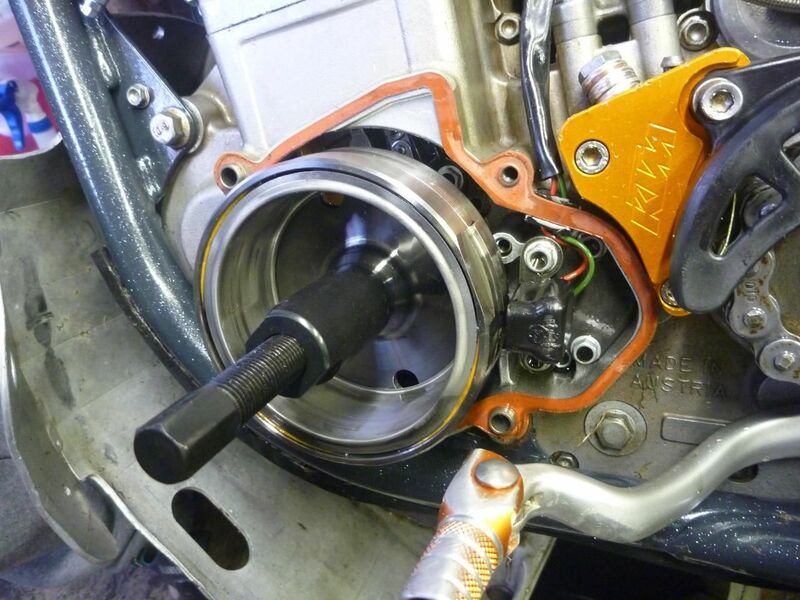 The old clamps had to be cut off as they are crimped on at the thermostat housing. I had to fiddle about a bit to get all the clamps in the right sort of orientation i.e. to clear the tank and other bits and pieces. i used a dremel to get the old clips off. The next day it was the third trip to The KTM Centre to pick up yet more parts including some extra carb pipes in orange. 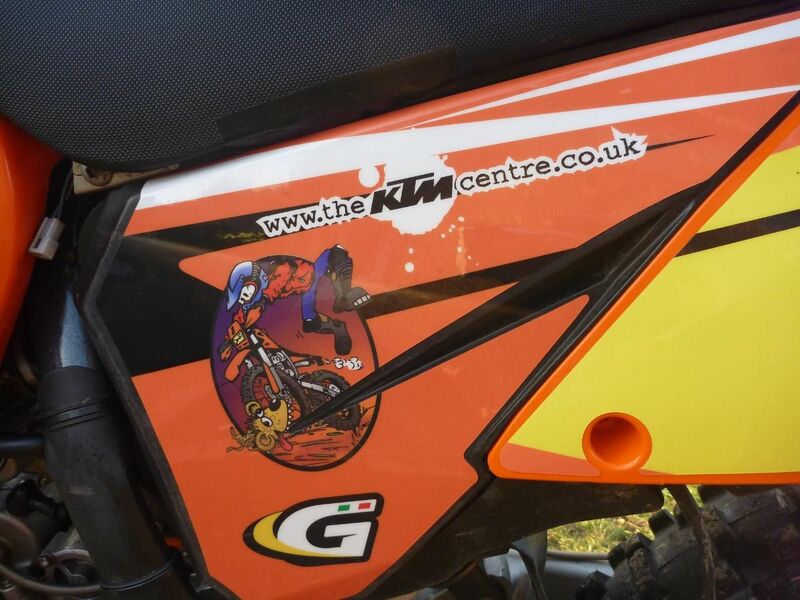 The ktm one is very much different to the freeflow one, in so much as it’s very soft and flexible, like soft silicon. This allowed the drain pipes to hang under the engine a lot nicer. The wiring and plugs that sit under the tank had to be redone as I had them bunched up a bit, and they really need to be no wider than the frame itself to work properly. I only found this out when I tried to fit the tank later on. I had a new bit of sticky protection film for under the tank too, but I needed more than one, so in the meantime I put some duct tape in place to protect the frame from the tank. 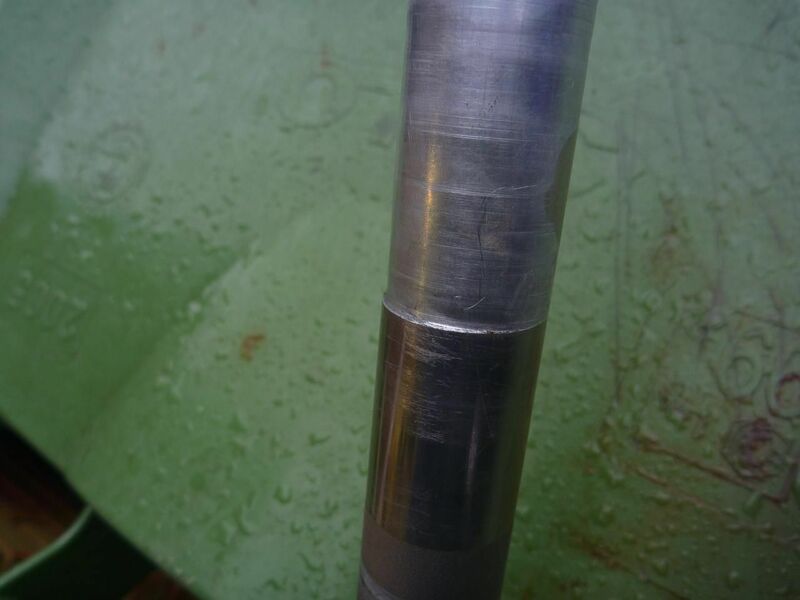 In the meantime I’d been doing a little polishing and the few aluminium parts that needed cleaning up were looking good. 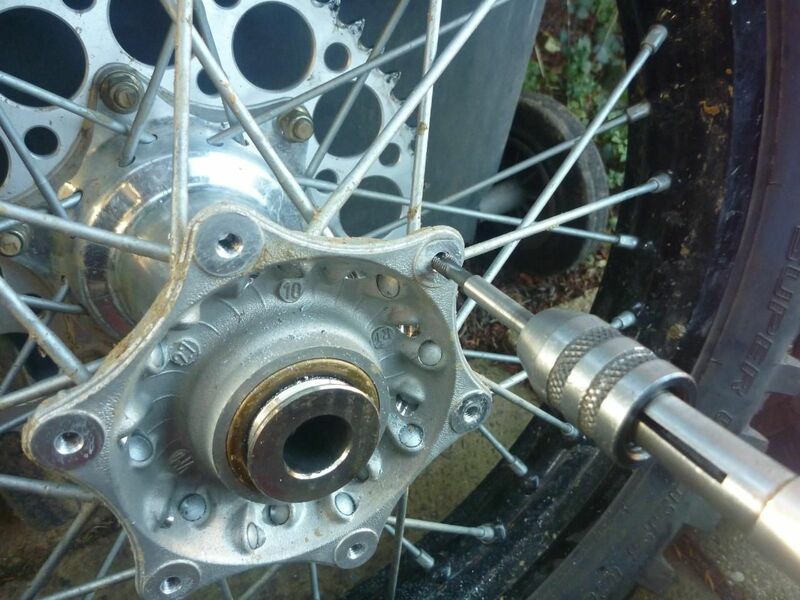 The last set of spares had included the new rear disc, so the rear hub was prepped for it by tapping out the mounting bolt holes and a general brush down. 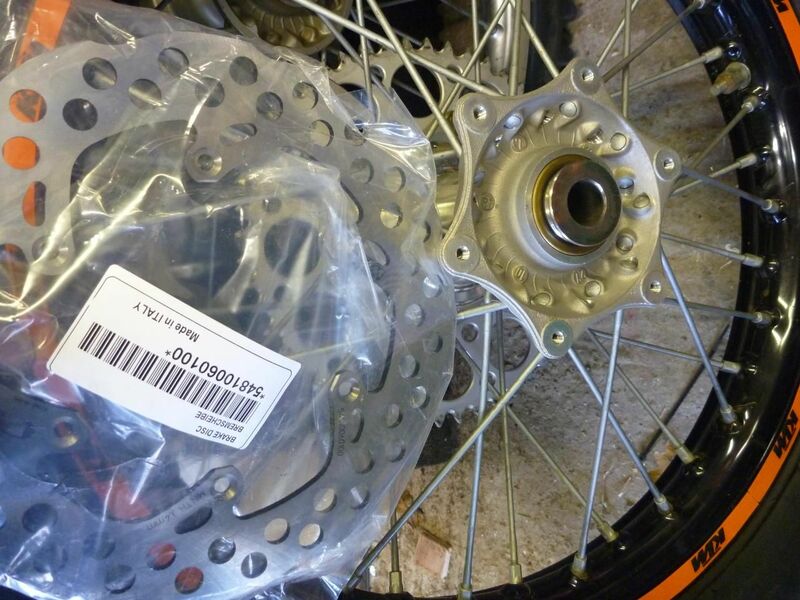 The new disc was attached using loctight on the bolts. The frame needed protecting from the engine guard and I had some high density foam strips which I glued to the frame’s down tubes & lower tubes. 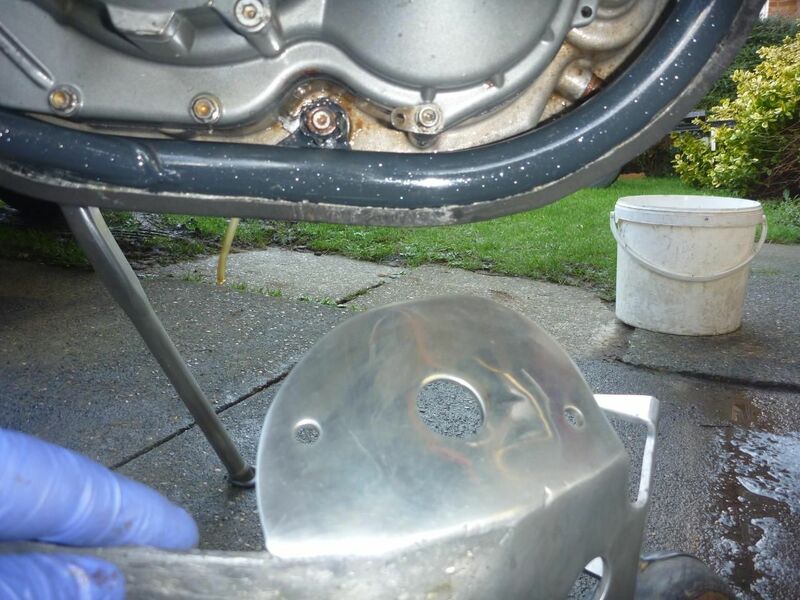 This was held in place with the engine guard to dry or ‘cure’ the glue, while the guard itself was pressed firmly home by mounting the bike on the stand for the night. 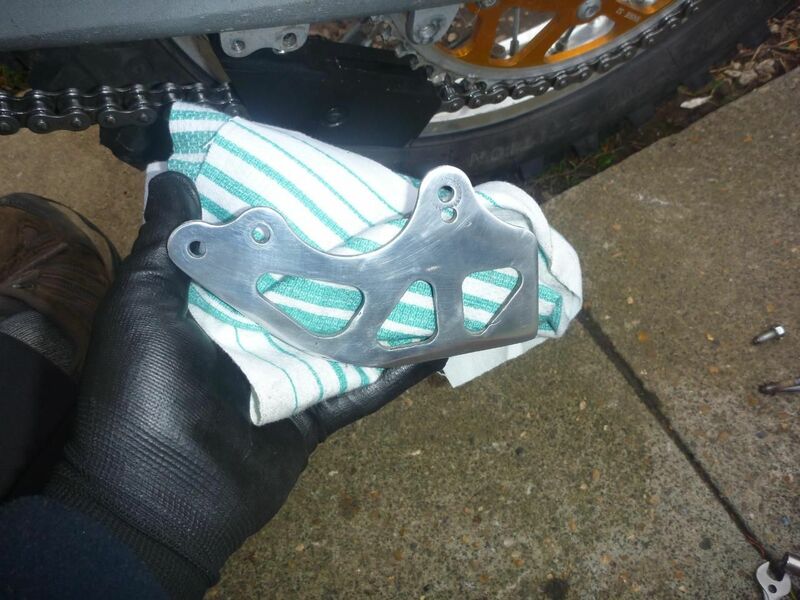 I’d had the brakes stripped off the bike and hanging up by the master cylinder since the strip down so that had really sorted any air trapped inside. 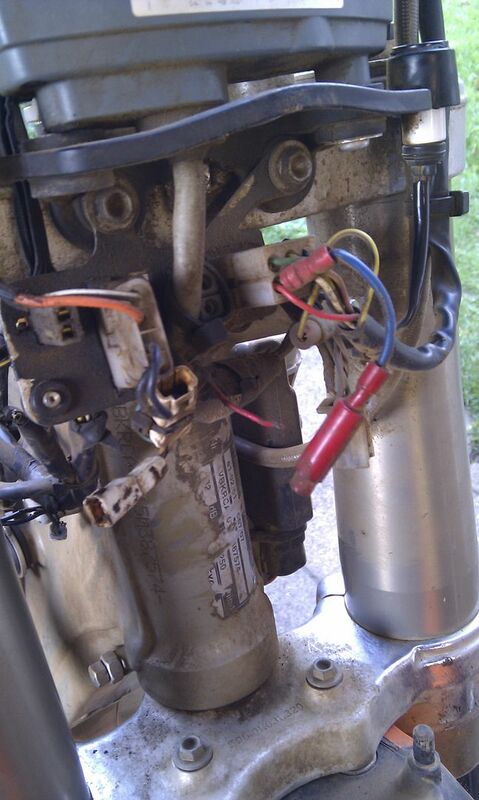 I had also clamped the master cylinder onto a bar and put pressure onto the lever by using a bungee. This, coupled with the vertical hanging, sorted the brakes out. I did have to drop the LHS front fork out again though, as the master cylinder wouldn’t fit through the gap between the fork and the frame. 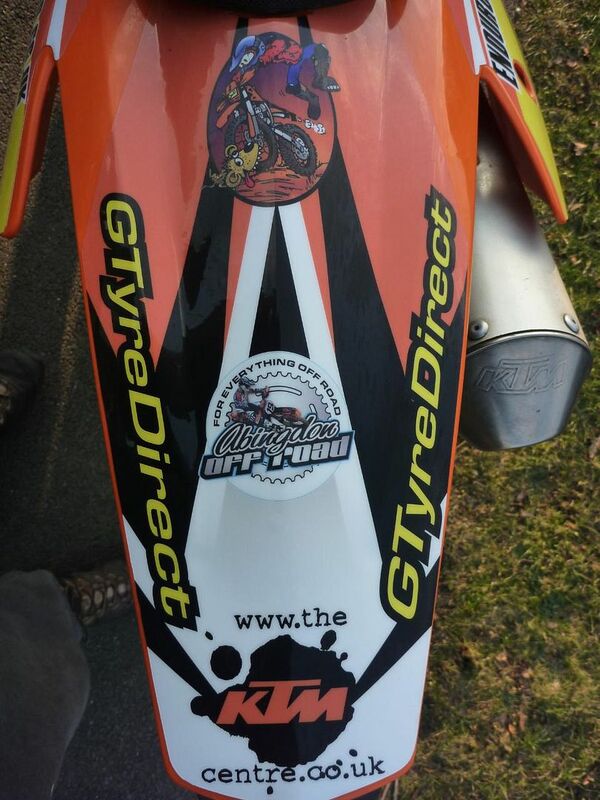 Final job before the shakedown run at Enduroland was to fit the bling wheel rim stickers. Even though they are nearly new, there are some big scratches on the sides of the rims already from stones, so I wish I’d thought of fitting them sooner to be honest. They are simple to fit and set off the black rims nicely. 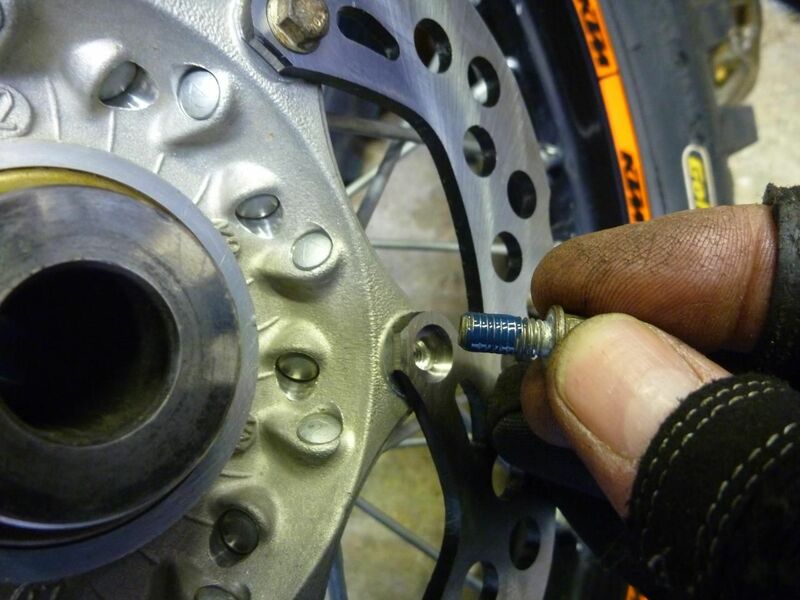 The final final job was to trim the rear tyre with a hot knife as I didn’t want to fit a new tyre for a practice day – not that I had any mind. 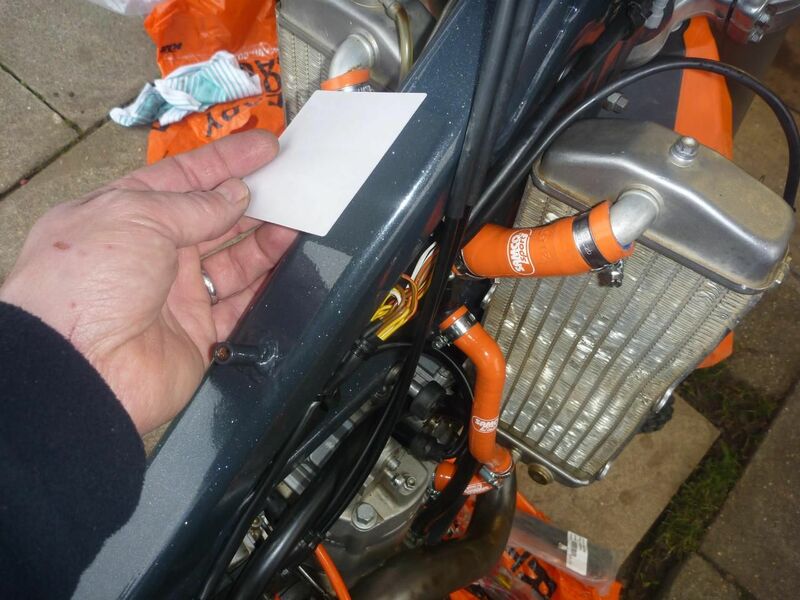 i did the same for the engine guard too.....but only on the bits you can see! The practice day went well. The bike struggled to start for some reason in the morning and I’m not too sure why. I ended up having to kick it into life which is strange. The putoline oil I had in it at the time is very thick when cold and the hotter cam I fitted last year has made it a bit lumpy down below, so that could be two reasons why. It was very cold in the morning as well so that didn’t help. During the rest of the day it ran fine and made good power, but I was starting to hear a funny whirring noise at one point so I was thinking that the other cam follower was on the way out, as I’d already replaced one before. The test day also gave me a chance to try out my latest toy, a set of Speedview goggles that has an electric motor that drives the rolloff system via a remote switch on the bars. Sounds trick, and it is. Despite some nay say’ers on the forums they worked a treat on the day and I’m looking forward to using them this year. They have their own report page and I’ll be updating the page as the year goes on. Well the practice day was great but the mud and grass got in everywhere. It took two power washes and two normal washes to get it sort of clean again. first shakedown run. 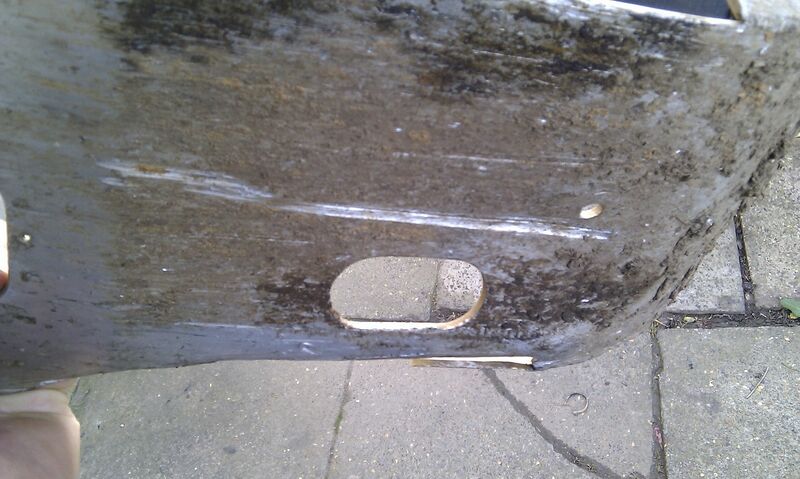 just as well i was using the old bodywork as i ripped off a rad scoop! First thing on Monday morning I was on the phone to the ktm centre to order parts but after a discussion I decided to pause for a bit. I pulled the tappet cover off to have a look and this removes the followers at the same time. Both rollers felt fine with no notchiness in them so I was back to square one. 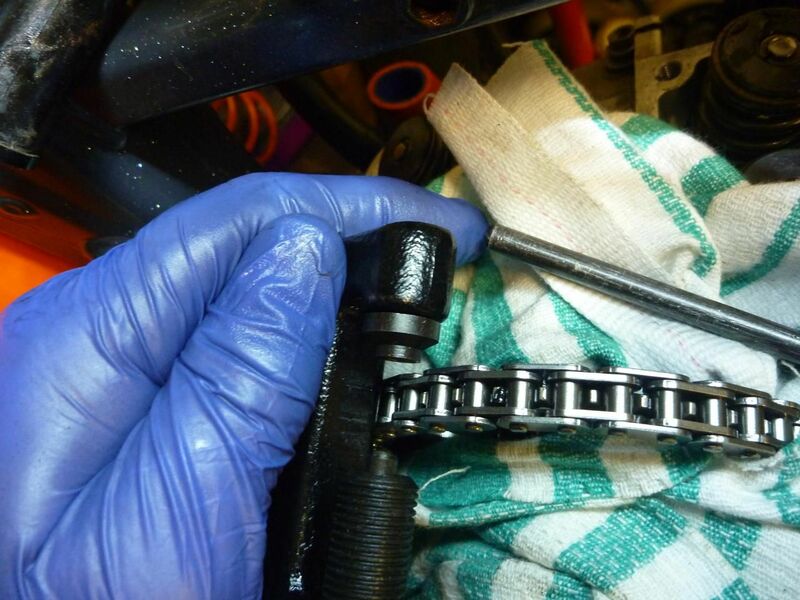 Well seeing as I had it apart this far it wasn’t much more work to replace the cam chain I wanted to do last year. The flywheel puller made short work of the rota and in no time at all the chain was split. 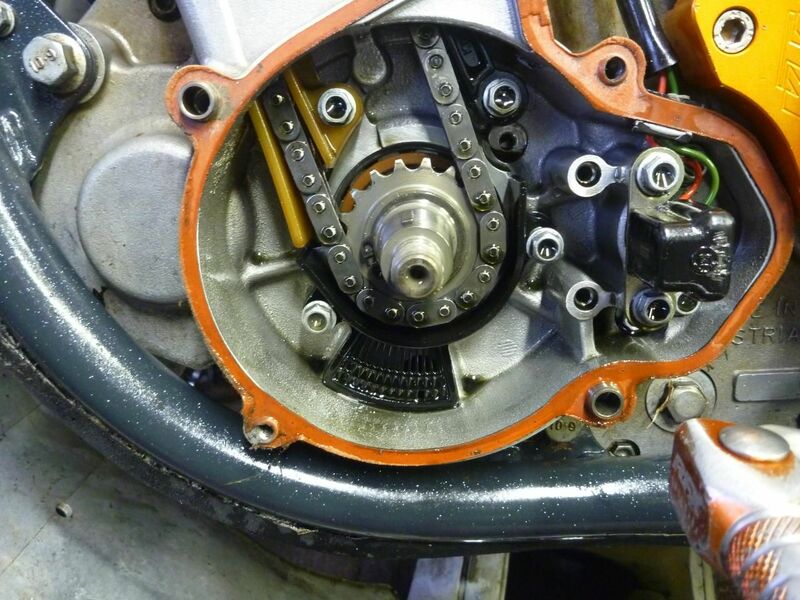 The cover below the crank sprocket was off and the old chain slipped out. Comparing it with the new one you could see it had stretched a lot. There were only two clicks left on the tentioner with the old chain, but five clicks once the new chain was fitted. The valves didn’t need adjusting and I was glad to see that the garage elves had returned the feeler gauge I like to use for this job. I just wised they’d stop moving my tools about while I’m working on the bike. I’ll put a size 13mm spanner on the back of the bike and then go to pick it up only to fine it in the toolbox where I know I didn’t put it. Maybe I should rig up a high speed camera to try and catch them at it cos they are dam fast! An oil change was next so I left the bike to drain overnight with the filters taken out and old oil blown out the oil ways with an airline. The oil I’m going to use now is Elf in 10w50 and it’s fully synthetic at a very good price. So firing up the bike after all that the engine sounded a little lumpy low down, but there were no nasty rattles or anything, so I must have put it all back together ok. 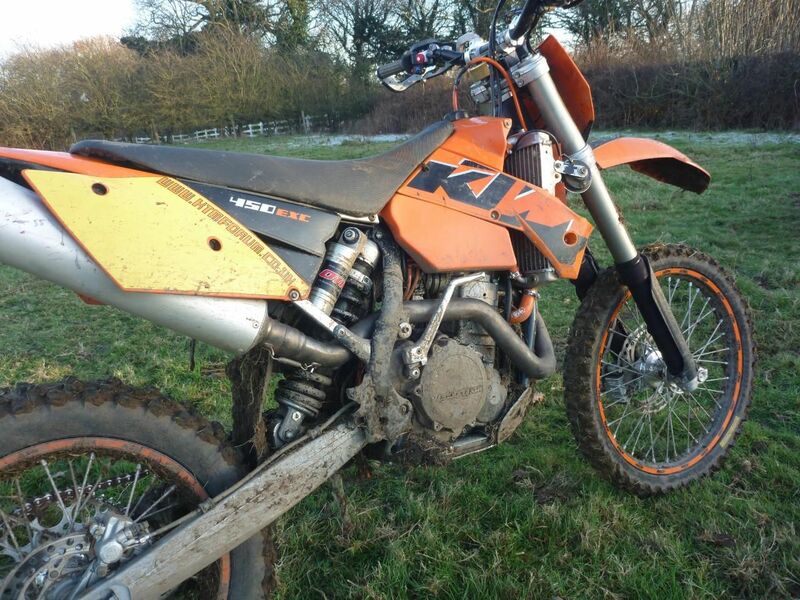 Mind you an rfs engined ktm of that vintage does sound like a box of spanners being rattled around when it ticks over. The newer ones always seem so much quieter than mine. while i was in spending mood i got new covers too. All that needed doing now was the bodywork but things haven’t been going exactly according to plan with delays and problems getting the pictures to the designer. In the meantime I has some small jobs to get on with. While I was in the mood for ordering I’d bought some bits on the ‘nice to have list’ too so now it was time to do some of the little jobs. I took of both brake levers and treated them to a good cleanup and fitted some new rubber covers to give the bike that new look. 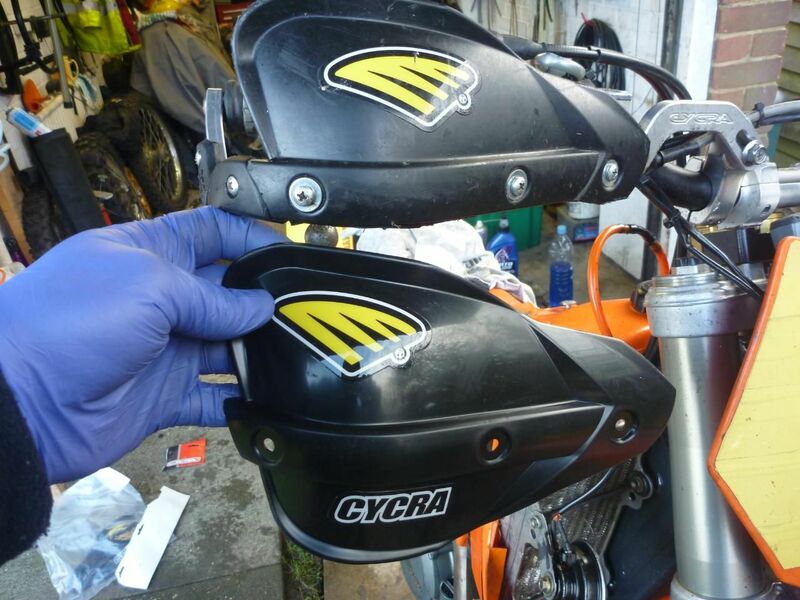 I also fitted the new Cycra hand guard plastics that had been broken before. I also needed to try and get the remote switch for the speedview goggles located a little better. 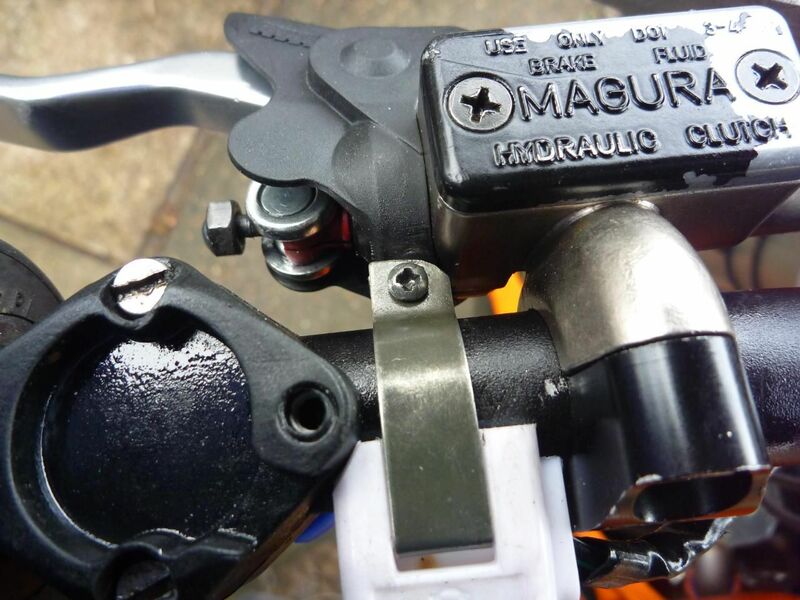 To do this I trimmed the mounting bracket slightly to help clear the brake master cylinder but it was still touching so I chamfered the corner of the button housing on the LHS to allow it to fit tighter to the KTM controls. This worked ok so now it can sit in an easy to reach position close to my thumb. 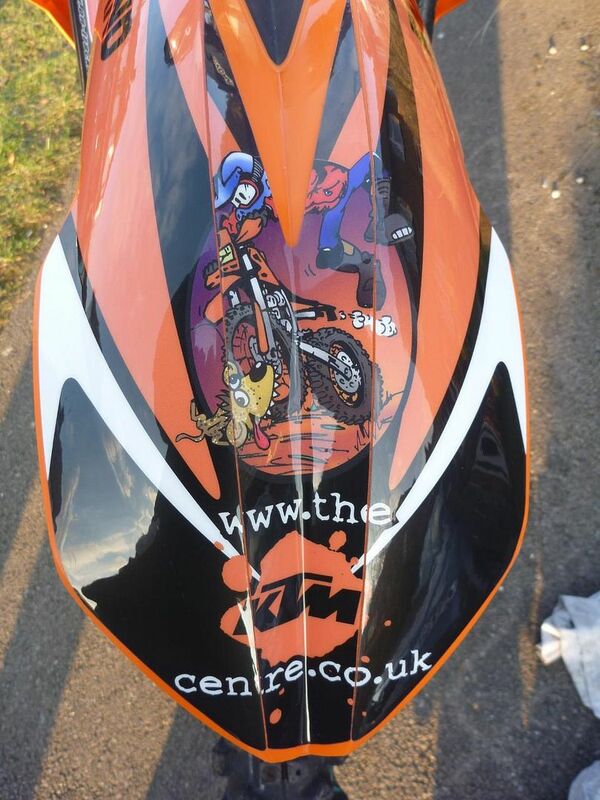 With only days to go before the first big race of the year ie ‘The Snowrun’ (hosted by the WTRA), I eventually managed to get my hands on the new set of custom graphics for the all new bodywork. As I may have already mentioned, I opted to go for a complete replacement front headlight off of the 2008 and newer ktm range. This fits the front mudguard from the same model line-up a lot better. Fitting the new graphics is a bit daunting at first as I’d forgotten how I did it last time. I found that peeling off a small section of backing paper, then cutting it off made it easier to line the whole lot up. Basically have about an inch or two of sticky bit and press this into place. Now check that the rest of the graphic is lining up correctly. If it isn’t then it’s a lot easier just lifting the small section. Do this by heating the stuck part with a hair drier and pealing it away. Then line up the non stick bit into place and press the sticky bit back down again, everything should line up now. Slowly peel back the backing paper and massage the graphic into place making sure there are no air pockets. A couple of times I thought it looked ok only to find a bubble once I took it into a different light. Squeezing the bubble out is next to impossible, so you can either heat it back up and re-do it or do the bodge job of pricking the bubble with a pin and then press down firmly to remove the air. ok before anyone asks - no its not a picture of a bike riding over a dog! its a cartoon of a african wild dog attacking a dirtbiker! I managed to get the new graphics all fitted on the Thursday night and the next day I pulled the bottom off of the carb to give the jets a bit of a clean out. You can do this in situ by loosening the carb rubbers and rotating the whole thing so that all the four bottom cap screws are accessible. 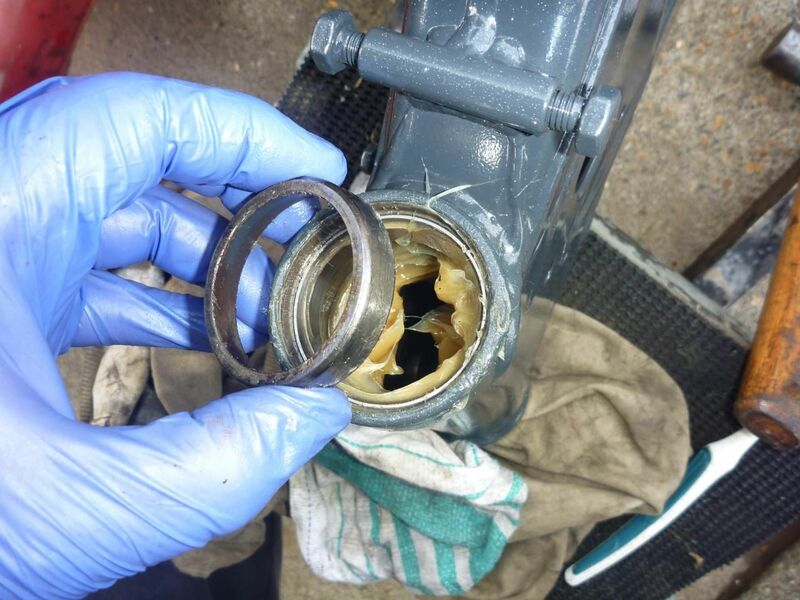 Removes these and the bottom of the carb comes off and you are free to remove all the jets for cleaning. I use a combination of a gas nozzle cleaning tool, electrical cleaner and an airline. All back together again, including the bodywork and it fired up just fine, once I’d given it a couple of turns of the throttle to squirt some petrol in that is. I must just be the cold I suppose as I never needed to pre=load the engine with fuel to get it to fire in the past, just the choke and a press of the button. Car packed, fuel loaded, bike finally finished..... and then they cancelled the race...due to snow! 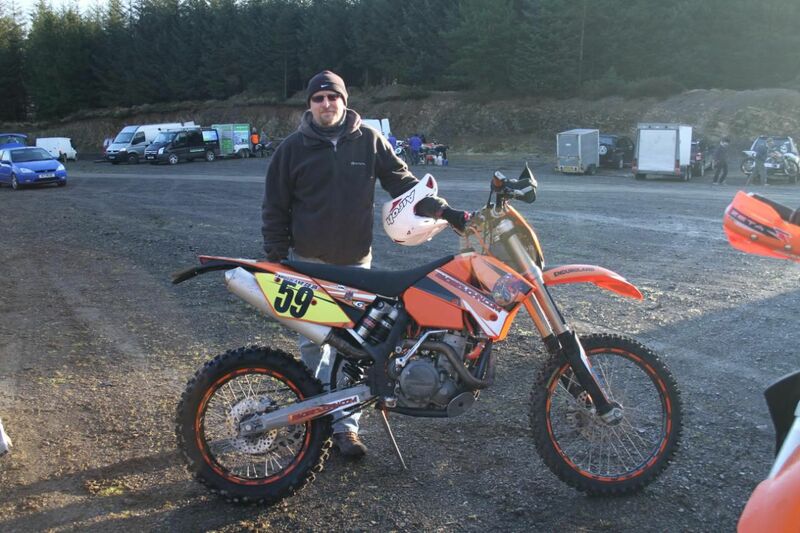 all ready to rock and roll at the snowrun enduro. ... jump to report ! If you enjoyed this report and would like to be notified of new reports or web site updates then join the mailing list. click HERE>> and send me an email.